How would you go about the process of closing out your career? Ask yourself: Why are you retiring? When will this happen? When should you inform your boss? How much notice should you give your boss? Which projects should you complete with the time you have left? What are the most important sets of information you need to transfer to the person who comes after you? Whom do you need to consider for appreciation for getting you through a successful career? What did they contribute? Where do you go from here? You need to work with your family to make it happen so that their concerns, goals and expectations are met, or at least considered. In my case, these questions were all answered through what became a haphazard shoot-from-the-hip process that in the end worked itself out. I do not recommend this process. My career in the National Park Service was 20 years long. I was an archeologist and museum curator during that time. Previous to my time in the NPS, I worked as an archeologist for universities and private companies throughout the Intermountain and Southwest United States for 15 years. I acquired a B.A. and M.A. in Anthropology during that time. Why did I retire from the NPS? Here is some detail. That portion of my life provided me with a certain amount of financial security for the future and for retirement. My wife also contributes greatly to that (our) security. So those goals are met. I no longer need the security that this job provided. The most important goal during this time in our lives is to see more and do more and go more places, so the idea of full-timing in the RV was the most natural solution. To make this a reality we knew that we would have to sell the house in Estes Park and live without a home base for some unknown time to come. Selling the house in the spring made more sense than in the winter. We knew we would need five to six months to downsize our possessions and get the house ready to sell. I also wanted this long to give my supervisor time to consider hiring behind me to fill my position. And I liked the idea of having this much time to finish projects I had started and to get the job into a position that could be taken over by my successor. Another issue for me was (and is) my health. I have survived two different cancers over the last six years. And the stress at work was sometimes doubled when I did more than I needed to. My skill set includes museum management and cultural resources. Sometimes I was asked to do both at the same time. And I just didn’t have enough patience to do both at the same time anymore. So it was better to move on. On October 22, 2013, I informed my supervisor of my intentions to retire, and that I would be choosing a date soon. That date became March 21, 2014. This gave him more than enough time to fill the position. The next step was to determine which projects to prioritize for completion. These were special projects that I had started which might not receive consideration by my successor. These included a photograph database copyright protocol for the park, the museum collections emergency operations plan and a survey of the backlogged park research permit program. I was able to complete these projects. The program I managed needed to be streamlined, documented and consolidated for my successor. Protocols for ongoing program operations had to be written. Up to that point, I had not taken the time, or had the time, to attempt this. Now it became a priority. 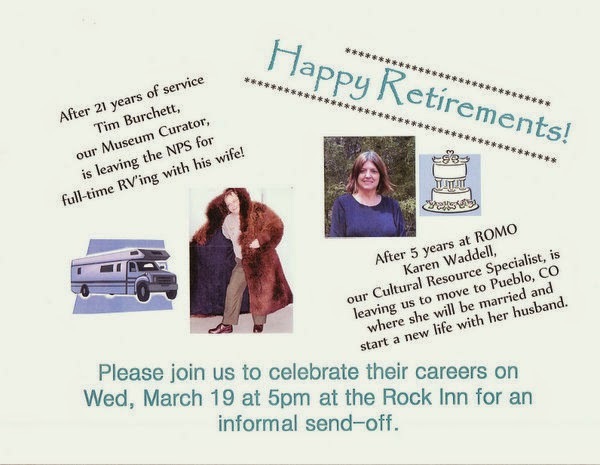 During my final week of employment, Rocky Mountain National Park held a retirement party for me and for another employee who was retiring at the same time. This is a time when your supervisor and fellow employees get up to roast you so that you are embarrassed. This only helped to verify that it was a good decision to retire and move on. After all, you can’t go back. The park has a tradition of gifting to the retiree some kind of meaningful remembrance. 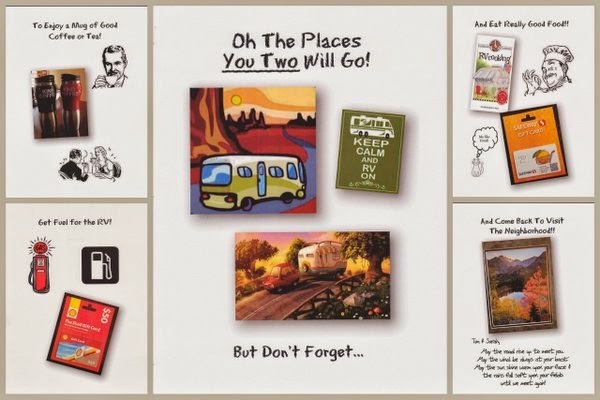 Knowing this was going to happen, I suggested to my supervisor that since we were downsizing and would be living in the RV, something that would fit into my back pocket would be great, as opposed to the typical gift that fits on a wall. So he came up with a Retirement Gift Booklet. As you can see, it comes complete with two mugs to enjoy good coffee, a gift card to fuel the RV and another gift card to eat really good food. A small manageable-sized landscape print was also included as part of the gift package. Thanks to all, and to Rich and Sheri. The park has a quilting club. The club created this work of art for me and presented it during the retirement party. The NPS also presents you with a carved arrowhead for your service. During this whole long process it occurred to me from time to time that there were many people to be thankful to for getting me into this position, for being able to retire with such a bright future still ahead. Many teachers and professors, fellow workers throughout three different careers, family, friends, my most recent co-workers who made the experiences at Rocky Mountain National Park so meaningful and wonderful, and my wife, Sarah (I love you). Well, I am retired. The house is sold. Sarah and I are on the road full-time with our cat. We are thinking about going to Alaska next summer. In the meantime, we are visiting national parks and sleeping late. Looking for farmers markets. Drinking coffee. Reading. Much more. I have started to do some consulting work with other national parks. Stay tuned for more on that one.